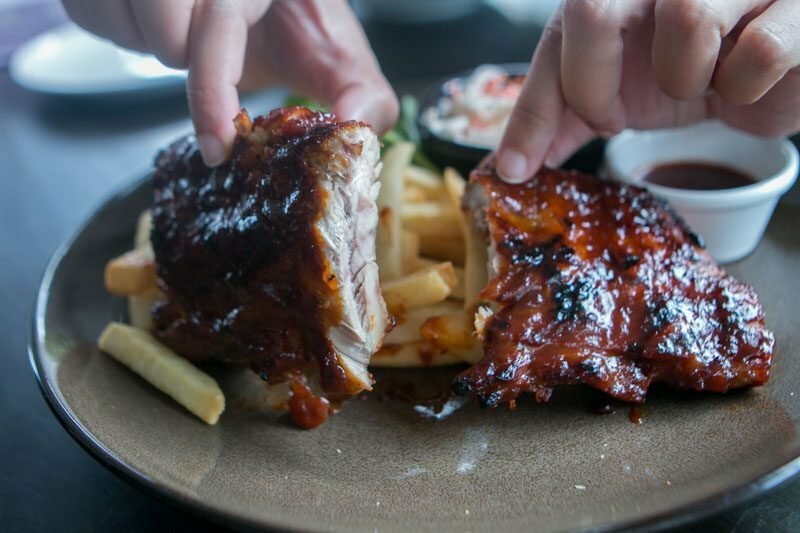 If you’re looking for a peaceful dining experience that brings you away from the crowd in busy Singapore, Oasis Steak & Grill offers just that. 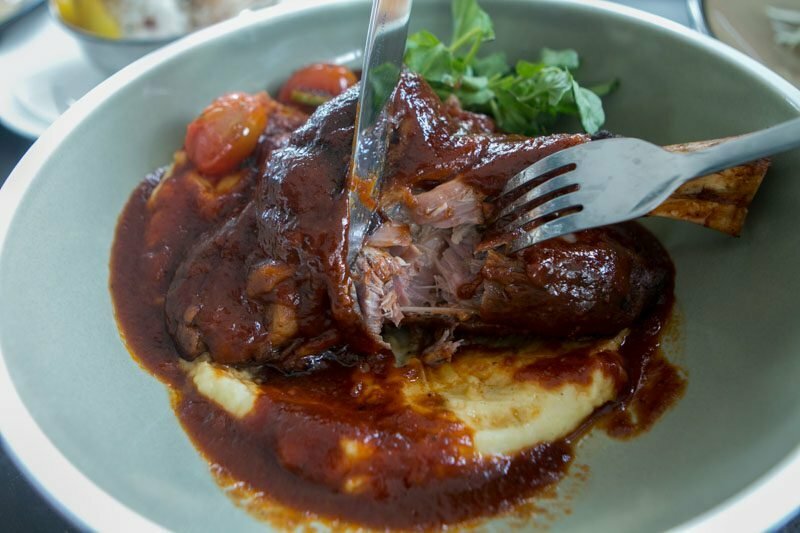 They have a ton of authentic grilled meats, such as a mouth-smacking tender lamb shank on a bed of mashed potatoes. 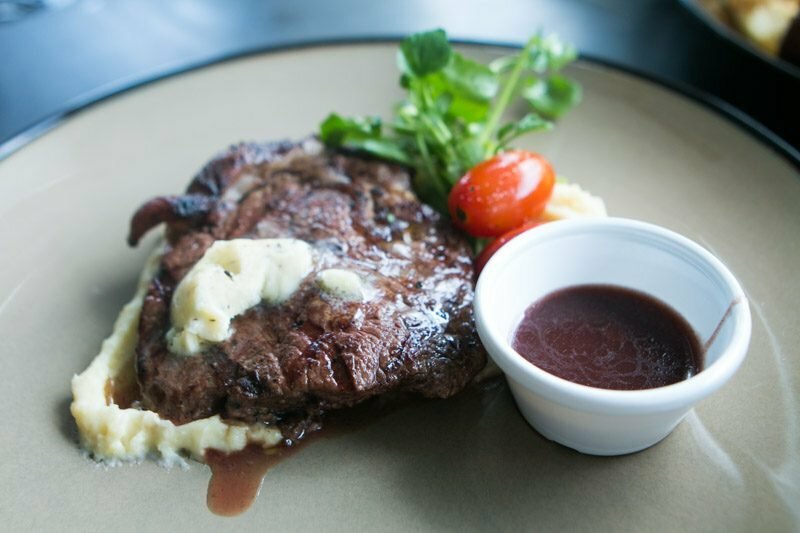 Located right next to Oasis LRT in Punggol, Oasis Steak & Grill was previously known as EC Club Cafe. They rebranded the entire restaurant in January 2019 to focus more on affordable and delicious grilled dishes instead of regular cafe fare. 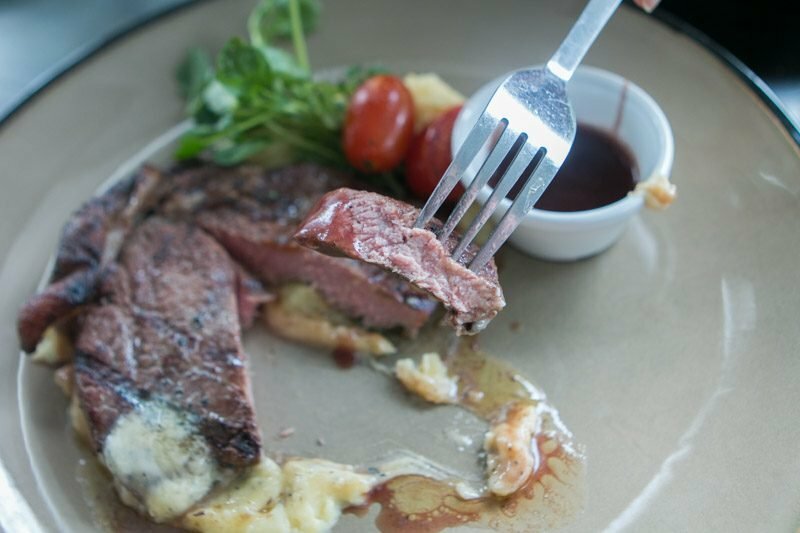 For those who aren’t familiar with Punggol, getting to Oasis Steak & Grill might seem like a hassle. You’d have to take the train to Punggol, and then switch to the LRT and get off at Oasis station. 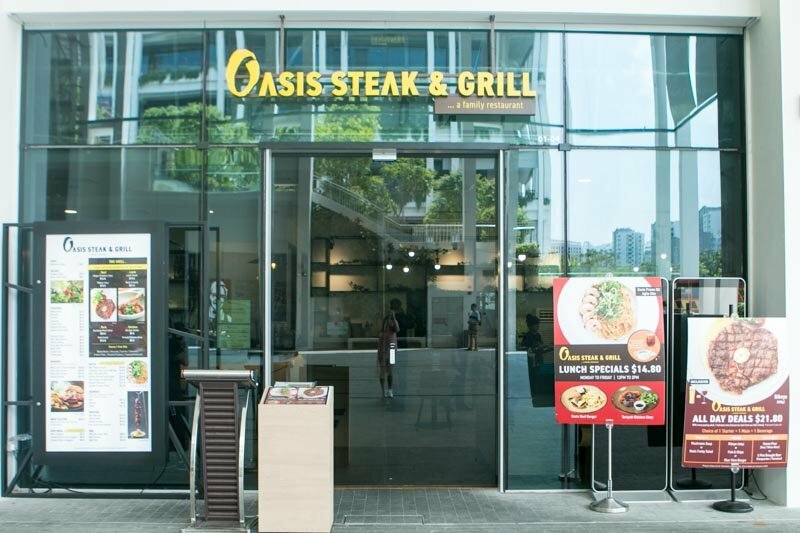 However, once you get to Oasis LRT station, finding Oasis Steak & Grill is pretty easy. It’s located within Oasis Terraces, an HDB-owned community plaza. The restaurant is visible from the open-air space in the middle of the building. While it has plenty of indoor seating, we suggest taking a seat at its al fresco area. 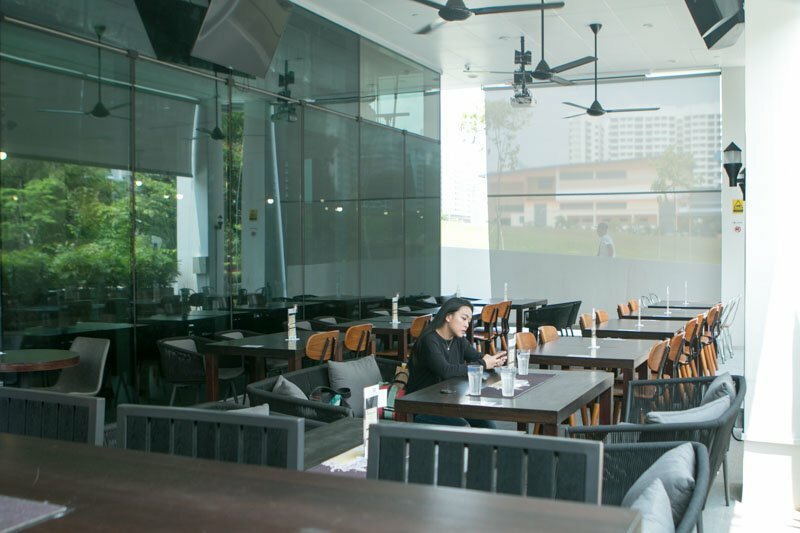 The brightly lit outdoor seating area was facing the idyllic riverbank and Punggol Waterway’s wave bridge. Windy and bright, the al fresco area made me feel like I had been transported out of Singapore. Be sure to request to be seated at the couches for an extra comfy dining experience! Hands down, my favourite dish of the entire meal was the Lamb Shank (S$19.80). It’s rare enough to find an eatery that does lamb shank fabulously well, and Oasis Steak & Grill certainly does a mean rendition of this classic roast dish. 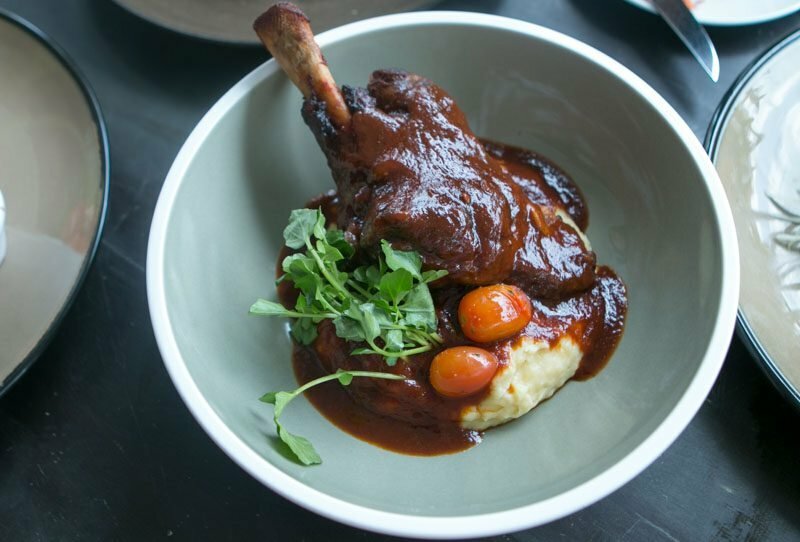 Served with the bone and on top of a mountain of creamy mashed potatoes, the Lamb Shank was slow-cooked in a beef broth-based gravy. The Lamb Shank was cooked superbly well — the meat was juicy, supple, and fell off the bone the minute I prodded its skin with my fork. The lamb shank was tender and sweet, and I loved how well the beef gravy complemented the meat. The sauce was rustic and tangy, like a mix between barbecue and red wine sauce, with a curry-like consistency. I absolutely loved Oasis Steak & Grill’s mashed potatoes. It was creamy, with a slight tinge of butter and milk, and naturally sweet. Despite its overall silky consistency, I still came across the occasional lump of potato, which is proof that the mashed potatoes were made by hand, a definite plus point. 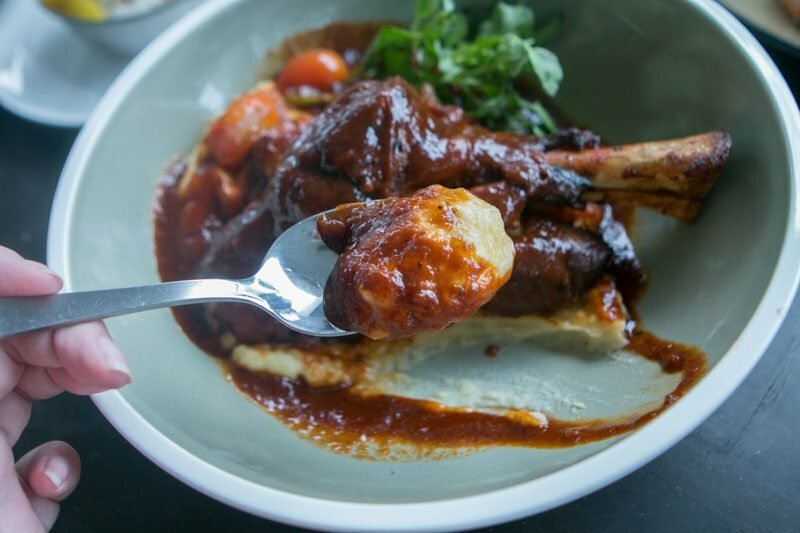 Honestly, I couldn’t decide which I liked more — the lamb shank or the mashed potatoes. 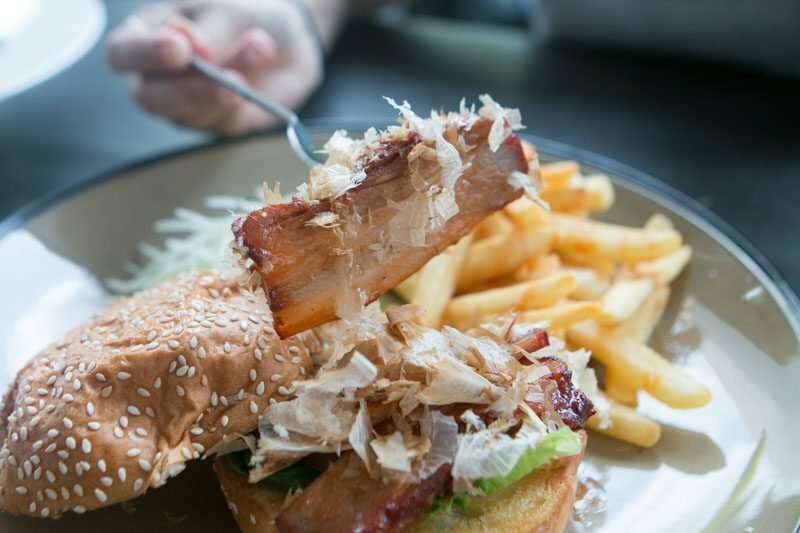 One of the more unique items on its menu, the Char Siew Burger (S$14.80) came with a large serving of dried bonito flakes, thick fries and shredded cucumbers. 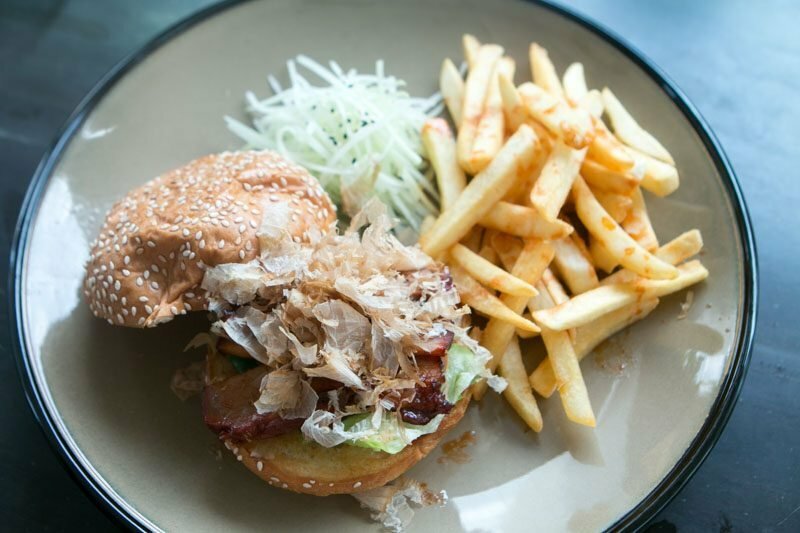 The char siew came in thick, juicy slabs and the dried bonito flakes added a surprising tinge of saltiness to the burger. The soft buns were slathered with a thin layer of butter and toasted on the grill till delightfully crispy. However, I wished there had been some sauce to bring the burger together as a whole. What’s a grill house without striploin steak? We got the Angus Striploin (S$16.80) done medium-rare, and was happy to note that Oasis Steak & Grill standardises its steaks at a substantial 200g each. Cooked till beautifully pink on the inside, the meat had a slight springy texture to it, with the inner bits being deliciously tender and soft. What I particularly loved about this dish was the red wine sauce. Smooth and light in texture, the red wine sauce was indulgent and sweet with a strong acidity and slightly dry aftertaste. Most red wine sauces I’ve tasted have more broth than wine, but all it took was one taste of Oasis Steak & Grill’s sauce to tell that it used a fair bit of authentic red wine to create it. 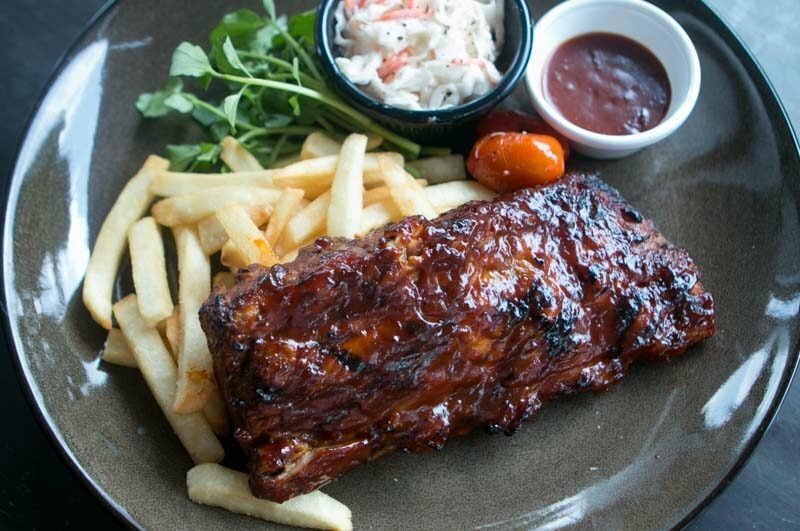 The BBQ Pork Ribs (S$13.80) came in a large slab and was served with crisp coleslaw and fries. For the price alone, the portions were definitely super worth it. I counted at least seven ribs alone. What a steal! What I thoroughly enjoyed about the pork ribs was the barbecue sauce. Smoky, sweet with a slightly nutty and charred aftertaste, the sauce was sticky sweet and finger-licking good. 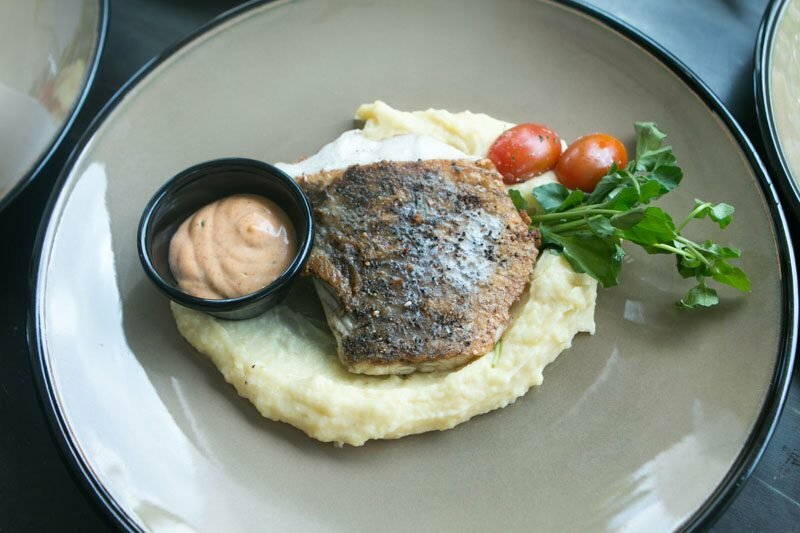 The Pan-Seared Barramundi (S$15.50) came with a bed of mashed potatoes and some paprika and lemon dill cream sauce. The barramundi came with a really nice and crispy skin. 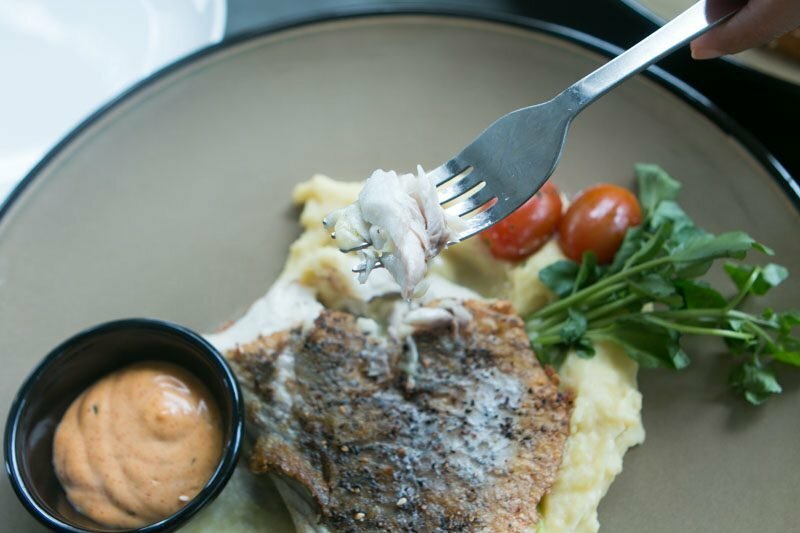 Despite that, the barramundi flesh was soft and sweet, and came apart easily with my fork. What I particularly loved was the paprika and lemon dill sauce. Tangy and creamy, the creamy sauce was sweet and honey-like, but with a slightly spicy aftertaste. Paired with the barramundi, each bite was refreshing, savoury and delicious. Definitely one of the more unique items on the menu, the Chicken Skewer (S$9.80) was served on an impressive standing skewer — the very same one it had been cooked on. Resting below the hanging skewer was a bowl of fluffy white rice, which was topped with yellow pickles, dried bonito flakes, sesame seeds and seaweed. The chicken skewers reminded me of char siew, roasted till the sauce on the outside had caramelised into a sticky, thick and sweet sauce. The chicken was deliciously tender and juicy, with a springy texture. 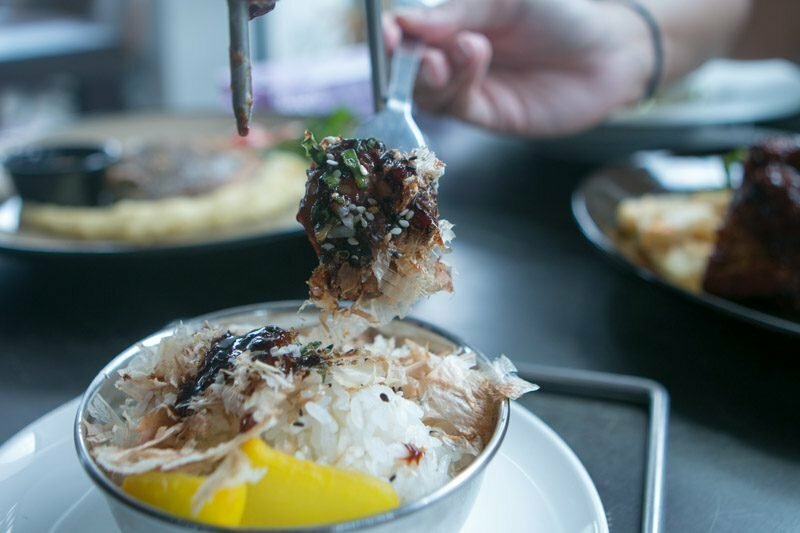 We recommend eating it together with the rice, as the juices from the chicken would’ve dripped onto the rice, making each mouthful filled with sweet, savoury and umami flavours. 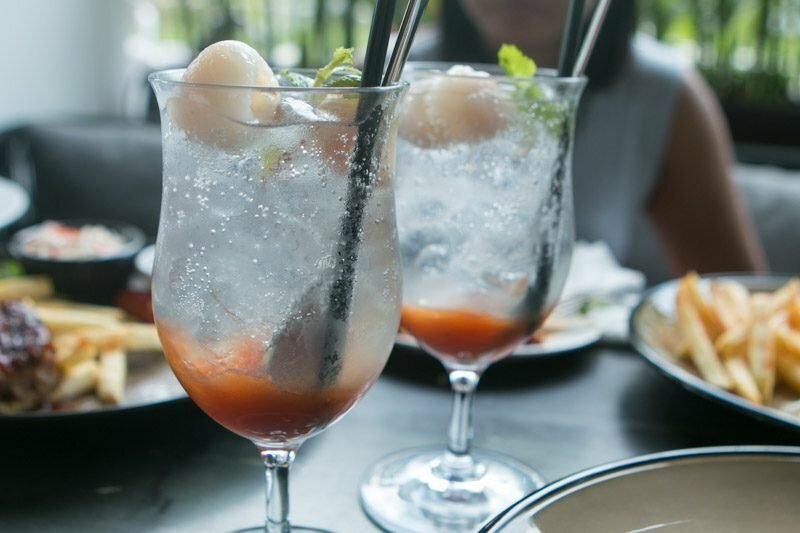 Chase away the afternoon heat with a refreshing Lychee Blossom Mocktail (S$5.80). Though slightly gassy, this thirst-quenching drink definitely whet my appetite. It was tropical and sweet, with a hint of citrus, rose and mint. The dishes at Oasis Steak & Grill were definitely excellently prepared. All the dishes came in decently sized portions, with a fair balance of flavours. Not only that, the prices are actually pretty affordable too, considering that all the ingredients used were of high quality. 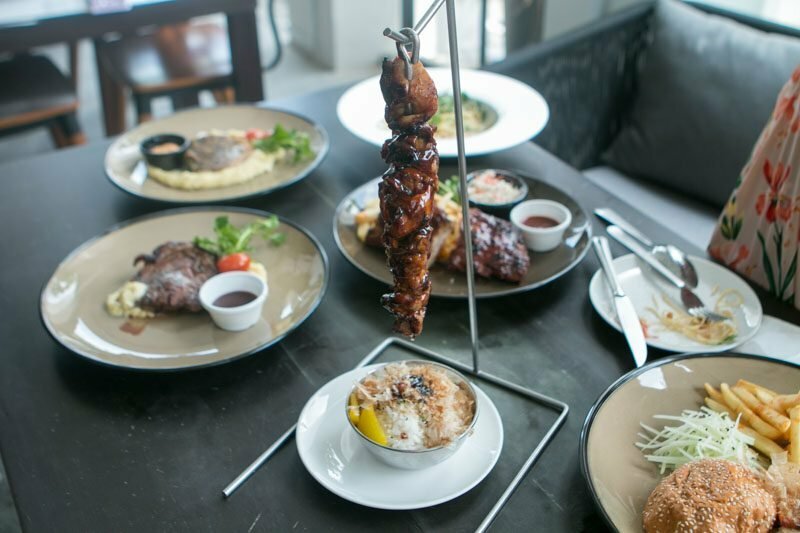 I particularly loved the Lamb Shank, Angus Striploin and the Chicken Skewer, and would totally recommend friends who stay in the area to give these few dishes a try. My only gripe would be the distance, but if you’re looking for a place to dine that’s away from the noisy and bustling city, I’d definitely say that Oasis Steak & Grill is worth it. Owner of Bobby the Pugtato and avid fan of historical fiction novels. The former Lit Major occasionally helps out at a canine hydrotherapy centre and enjoys petting cats at HDB void decks when she has the time.